I pulled out an oldie but goodie, as I work on a character for an upcoming Bastille Family novel. 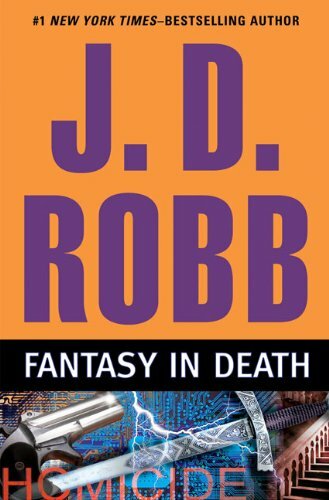 It’s Fantasy in Death, by J.D. Robb (the pseudonym for bestselling romance author Nora Roberts). Anyway, the story is set around 2060, and involves the death of one of the partners in an upstart video game company. It’s a classic locked-door mystery: the victim was alone in a locked room, playing a video game, and there were no signs or evidence of anyone else entering or leaving the room. So whodunit? The series protagonist, Lieutenant Eve Dallas, is very technology-challenged and has no idea how to navigate the very tech-heavy world of video games. She gets valuable assistance from her husband, Roarke, who is very skilled in his own right in the area of computers and technology, as well as the Electronic Detective Division of the New York Security and Police Department. (Since this is over 40 years into the future, I’m hoping that a separate division that focuses on technology used in crimes becomes a reality). The plot is pretty good, and there is an interesting twist at the end. This is one of my favorite books in the entire In Death series, of which I have every book so far (Fantasy in Death is the 31st book in the series, or something). I especially like the positive portrayal of female gamers (so refreshing in the wake of #gamergate) and the leap in applications of video games, virtual reality, and holograms. The book came out in 2011, so it should be readily available at your local library, if you’re not inspired to purchase a copy for yourself. I do recommend it, as it is an entertaining read. LIVE Q&A with me, TONIGHT! I’m doing a Google Hangout tonight, 10/14, 7-8 pm ET. Come join me as I discuss my books, self-publishing, and other writing stuff. Tell a friend!